1985-02-19 N4522V China Airlines Incident Enroute TPE-LAX, Lost thrust in no. 4 engine, then made uncontrolled descent from 41000 feet to 9500 feet over the Pacific Ocean on flight from TPE to LAX. Aircraft suffered significant damage, but was eventually returned to service. Download Report in PDF format. 1985-04-25 N4522V China Airlines Other SFO Boeing completes repairs; aircraft returns to service. 1987-09-14 N4522V China Airlines Incident LAX The engine cowling of the aircraft hit a vehicle which was disabled near taxiway. 1995-01-01 N4522V China Airlines Seen HKG See video of aircraft taxi. 1995-01-02 N4522V China Airlines Seen HKG See video of a takeoff from HKG. 1998-02-04 N4522V All white, no titles Seen LAS In storage, engines sealed. 2001-12-18 N4522V Global Peace Initiative Inc Bought Sold by Fleet Bank to Global Peace Ambassadors. 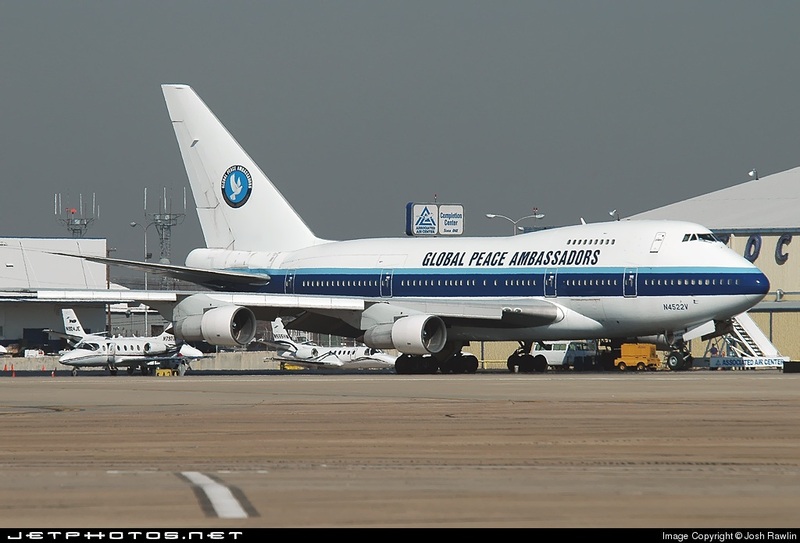 2002-04-30 N4522V Global Peace Initiative Inc Other Airworthiness certificate issued to Global Peace Initiative, Inc.
2003-12-01 N4522V Global Peace Ambassadors Ferried TUS Ferried MDT-TUS for maintenance. 2004-01-26 N4522V Global Peace Ambassadors Flight TUS Being upfitted and refurbished by Renegade Venture Corp. Flew a demo flight TUS-TUS. 2004-03-04 N4522V Global Peace Ambassadors Back In Service TUS Renegade Venture Corporation announces completion of major service work. 2004-08-19 N4522V Global Peace Ambassadors Seen BWI Seen parked at Baltimore. 2004-12-03 N4522V Global Peace Ambassadors Seen SJU Seen at San Juan, mission unknown. 2005-01-01 N4522V Global Peace Ambassadors Seen SJU Seen throughout the week of 12/25 at the airport. Engines were running on 2005-01-01 as if preparing to depart. 2005-01-02 N4522V Global Peace Ambassadors Seen CVG Arrived at CVG at Approx 2115. 2005-01-13 N4522V Global Peace Ambassadors Seen CVG Departed CVG for EFD, returning to Houston (base) after Tsunami relief mission. 2005-02-02 N4522V Global Peace Ambassadors Global Peace One Seen GOT Arr 18.07 UTC from CMB. ETD feb03 time 11.00 UTC to YYZ. 2005-03-16 N4522V Global Peace Ambassadors Status EFD Parked at the Coast Guard hangar at Ellington AFB. Scheduled for maintenance soon? 2005-05-05 N4522V Global Peace Ambassadors Ferried DFW Ferried EFD-DFW for C-check. Maintenance to be done in Delta hangar by furloughed United mechanics. 2005-06-15 N4522V Global Peace Ambassadors Ferried MZJ DFW-MZJ, Ferried to Evergreen facility at MZJ for service work on passenger oxygen system. 2005-06-20 N4522V Global Peace Ambassadors Global Peace One Seen MSC Global Peace One is now located back in MSC (Mesa, Arizona) after an aborted trip scheduled from MZJ (Marana, Arizona) to LAX (Los Angeles, California) then to EWR (Newark, New Jersey) on Saturday to pick up a group bound for Poland and Israel. 2005-06-22 N4522V Global Peace Ambassadors Flight Flown from Pease International Tradeport to Damascus for start of new international mission. 2005-06-27 N4522V Global Peace Ambassadors Seen BOM Seen parked near international terminal in Mumbai. Still there on 4 July. 2005-07-09 N4522V Global Peace Ambassadors Flight Flight from Tripoli, Libya to Bangor, Maine. 2005-07-12 N4522V Global Peace Ambassadors Seen LIT Parked in front of Central Flying Service north terminal in Little Rock, AR. Department of Homeland Security is keeping a very close eye on the aircraft. 2005-07-13 N4522V Global Peace Ambassadors Seen YQT Landed at CYQT on Runway 07. There were some ground handling issues in progress while attempting to get people off the aircraft. The roll up stairs were a little too short and some 8 feet too low to allow those on board to exit. Ground crew on the ramp were saying there never has been a Boeing 747 on the airport before. Judging by the landing and roll out, the aircraft must have been extremely light. The aircraft was slowed to a safe taxi speed at the 4500 foot position on the runway. 2005-07-13 N4522V Global Peace Ambassadors Seen YQT As an aircraft maintenance engineer for Wasaya Airways L.P., I was astonished by the presence of this huge aircraft at our airport here in Thunder Bay. 2005-07-31 N4522V Global Peace Ambassadors Seen YQT aircraft was sitting on the ramp. 2005-11-12 N4522V Global Peace Ambassadors Seen YQT Seen being winterized. Airport manager reports all parking fees are being paid promptly. 2005-12-03 N4522V Global Peace Ambassadors Seen YQT Engineer flown in to prepare plane for flight. Tire pressures found to be 100 to 150 psi below spec, hydraulic levels as well as engines oil levels very low as well. APU was started up and run most of the day. Possible departure Sunday after dark. Destination not know at this time. 2005-12-08 N4522V Global Peace Ambassadors Status YQT Aircraft will be ferried shortly. FAA Ferry Permit applied for and aircraft is being readied to leave the cold climate of YQT. 2005-12-13 N4522V Global Peace Ambassadors Other YQT Flight crew at YQT, but still awaiting FAA to grant ferry permit. 2005-12-13 N4522V Global Peace Ambassadors Seen YQT Performing taxi, braking, and engine run up tests in preparation for ferry flight. 2006-04-22 N4522V Global Peace Ambassadors Seen TIJ Seen sitting outside the AVOLAR hangar at Tijuana airport. It seems that work on the aircraft has not been started yet at this date. 2006-12-17 N4522V Global Peace Ambassadors Seen TIJ Still sitting outside Avolar hangar. No work taking place. Engines uncovered, and no measures appear to have been taken to preserve the planes serviceability. 2007-02-01 N4522V For Sale Aircraft is reportedly for sale. 2009-05-17 N4522V Global Peace Ambassadors Seen TIJ Aircraft parked at 32.544059, -116.965621, visible on Google Maps Satellite. 2010-05-20 N4522V Global Peace Ambassadors Other TIJ Plane has been moved from its last location. When we landed at Tijuana airport, I believe it was moved inside the only big hangar at the airport. 2010-06-12 N4522V Global Peace Ambassadors Seen TIJ Parked at the A Volar hangar ramp. 2010-07-23 N4522V Global Peace Ambassadors Seen TIJ Rolled out today morning to Avolar Hangar ramp and stood there. It is now 6:30 PM PT, hangar door closed, airplane remains outdoor at west end of the ramp. 2010-08-05 N4522V Global Peace Ambassadors Other TIJ Not visible at the Tijuana International Airport. 2010-08-20 N4522V Global Peace Ambassadors Seen TIJ 11:00 AM plane been pulled half out from right hand side of Avolar Hangar. 6:30 PM with plane inside. Now 8/21 9:00 AM no action from Hangar. Doors remain closed. 2011-09-28 N4522V Global Peace Ambassadors Seen TIJ Sitting outside of the hangar on the north side of the airport. 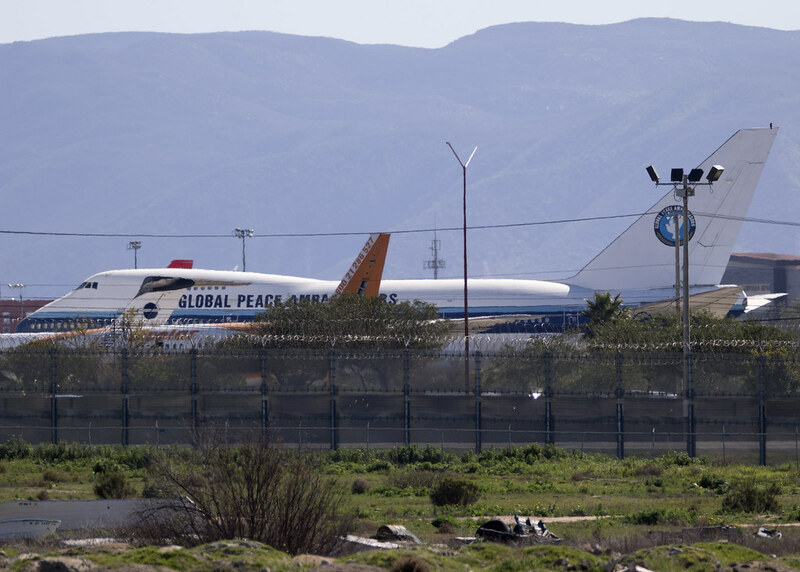 2013-03-03 N4522V Global Peace Ambassadors Seen TIJ Parked outside hangar. 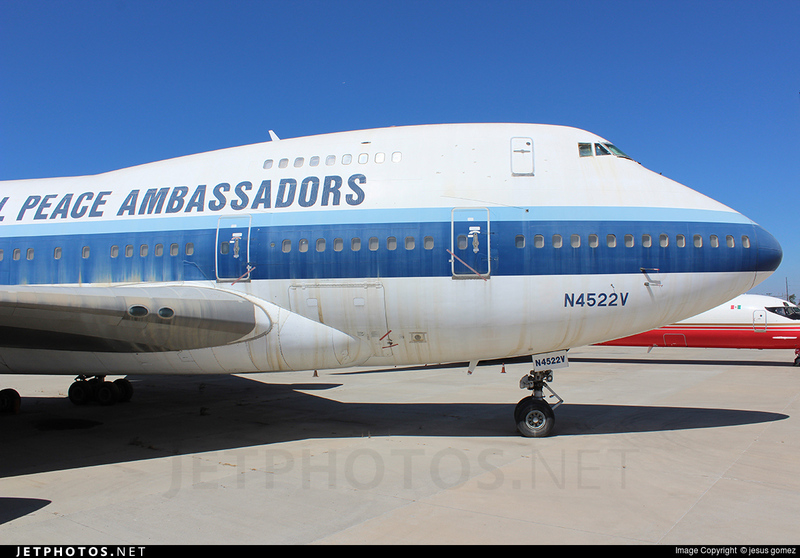 2018-05-14 N4522V Global Peace Ambassadors	 Seen TIJ Still sitting this really saddens me.